May December Madness : Santa's Not Real - And I'm Telling My Kids! RJ and I do not encourage belief in Santa Claus. Let me explain exactly what that means before you tell me I am ruining my children’s fun, or that I’m a bad parent. Santa does not exist. He is not real. I want my children to think critically. Encouraging them to believe in a fat man who delivers presents to all the good children in the world, on one night, does not teach critical thinking (or a good understanding of physics). This does not mean we do not talk about Santa. 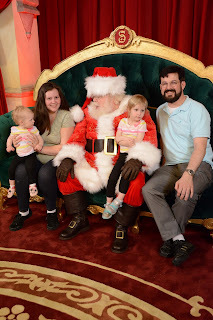 We got family photos taken with Santa for our holiday cards this year. Rose knows who Santa is and that he brings presents. But she will know her presents on Christmas actually come from me and RJ. Santa is not real, Rose thinks about him the same way she thinks about Elsa, Tinkerbell, Cinderella, or Shrek. They are all imaginary characters and they all have a part in her imagination. I encourage her to use her imagination. The other day her blanket was laid out on the floor in the shape of a triangle. She sat down on it and asked me to come ride on the “dragon” with her. I did and pretended to fly around with her for a little. It was a lot of fun I love seeing her little imagination hard at work. Letting children think of Santa like they think of their favorite Disney character will prolong the fun. There will not be a day when Rose no longer “believes” in Santa. There will not be a day she feels hurt and let down because she discovers Santa isn’t real. He never was real, and never will be, just like any other imaginary character. Santa is fun, it is how we celebrate Christmas as atheists. We celebrate a time of selflessness, empathy, and love for everyone no matter their color, sexual orientation, or religion. Everyone deserves to feel loved and cared for around this time of year no matter what you celebrate or don’t celebrate. 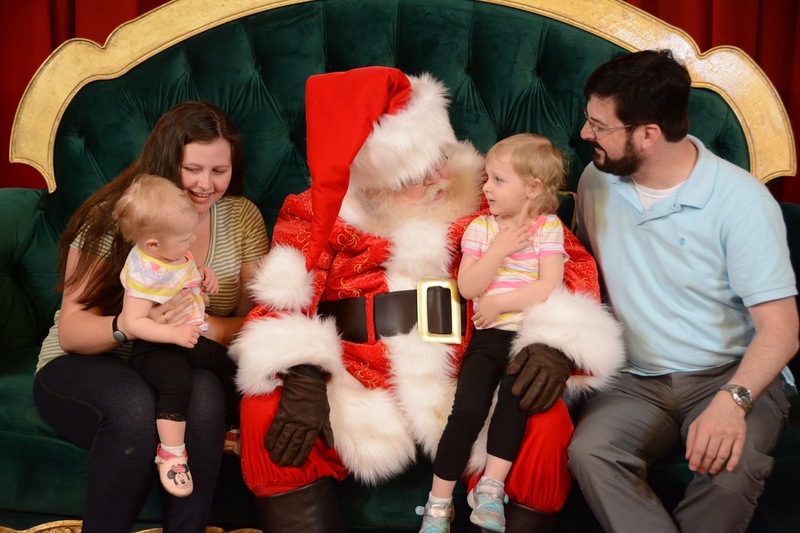 I do not rely on Santa to get good behavior out of my children. I want my children to be good people because it’s the right thing to do. I do not want them to be good just so they don’t get coal in their stockings. I don’t remember believing in Santa Claus. My Grandpa on my Dad’s side dressed up as Santa every year, from what I can remember he was the only Santa we saw and got photos with when we were kids. Young children are really good at seeing/feeling/smelling people they know. I don’t think my parents actively lied to me and told me that, that was “Santa” and not Grandpa. I am glad my parents did not insist on convincing us Santa was real. I do not want to lie to my children. I do not want them to lie to me. I think creating a false reality by lying to them daily during the holiday’s is not going to make the best relationship. I want my children to trust me and lying to them from day one, trying to convince them Santa is real will not create a trusting relationship. I think trust is much more important, rather than them believing a silly children's story is real. I hope this got you thinking. I think the holiday season might be a lot better if it wasn’t about anything except loving and accepting each other. I hope this makes sense, and it didn’t sound like my inner dialogue running away with itself to much. Thanks for reading!